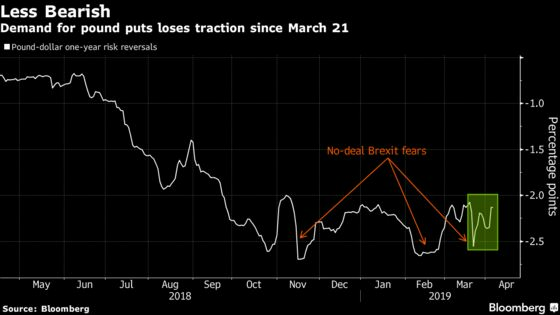 (Bloomberg) -- While news of U.K. lawmakers blocking a no-deal Brexit may have come as music to company executives’ ears, it was business as usual for currency traders. A softer form of Brexit or a long extension of the divorce deadline have been the market’s base cases for a while, with the prospect of a disorderly exit seen as diminishing lately. The pound failed to gain ground Thursday after the vote in the House of Commons, and may need a further unwinding of short positions to gain some positive momentum. Pound investors have been pricing out the prospect of a no-deal Brexit in the past couple of weeks. Sterling’s volatility skew, which shows the relative demand for bullish options versus bearish ones, had already shown signs of optimism on the U.K. currency ahead of Wednesday’s vote in Parliament. 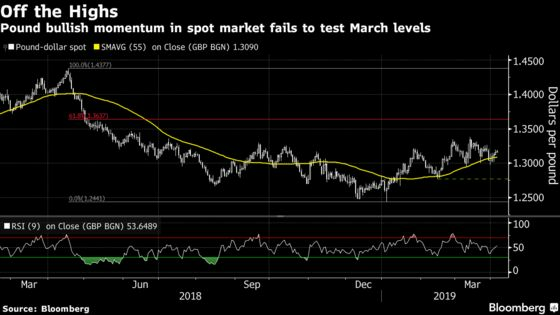 Still, the pound hasn’t been able to enjoy a big rally as short-term market positioning is now more balanced after the currency outperformed Group-of-10 peers this year, while U.K. data suggest the Bank of England may be some way off from sounding hawkish. Risk reversals still show sterling put options commanding a premium, not only due to Brexit risks but also a buoyant dollar. Any further unwinding of short positions through options should provide some momentum to the cash market. Yet, what may matter more is the average spot level of sterling shorts that longer-term investors hold. The pound dropped from near $1.44 a year ago to below $1.25 earlier this year, and has seen some strong rebounds. This has allowed investors to enjoy a better average level than when the shorts were initially put in place -- as a result, they may feel no urge to close positions as long as sterling remains below important technical levels such as $1.3637, a key Fibonacci retracement.